Ting has been tattooing for 8 years now. 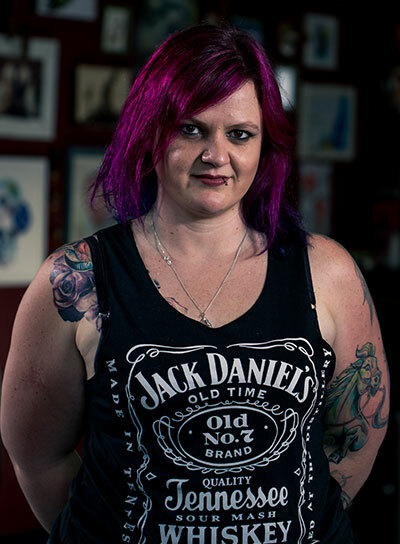 Her Career kicked off in about 2009, where her hobby became her career by taking up a tattoo apprenticeship with the well known brand and store Iron Fist Ink in Rosebank, Johannesburg, South Africa. Since then, Ting has become known in the industry for her soft touch and delicate watercolour pieces. Her beautiful shop full of plants, ornaments and pictures can be found in the lovely suburbs of Blairgowrie. She enjoys all forms of art activities, has a profound love for animals and the light of her life is her son, Rocco! Kyle also joined the team this year proving that even an all girls shop needs a man or two around! 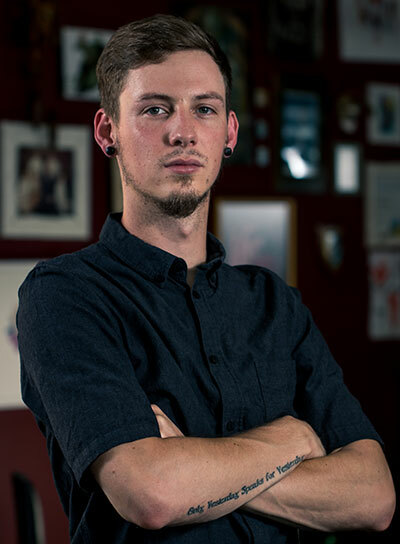 He has been in the tattoo industry for a few years now and is currently a junior artist with us. He has a love for linework and geometric designs and this lucky number 13 guy has some killer designs up for grabs. He is also the only person we know that happens to have more nicknames than you can count on all fingers and toes. The founder of Steamed Rabbit, is a jaw dropping freelance artist who does unbelievable drawings, she makes the coolest mugs and takes commissions to draw/paint portraits or any other wild ideas you may have. She joined Ting’s Tattoos during the course of 2017 to assist with custom design work and has helped oil the shop into a powerful machine running at full tilt to push out great tattoos! She was also the organiser behind Pins and Needles our recent alternative market that we held outside our store which had a massive turnout! We will hopefully be doing this market every 8 weeks now, so keep an eye out for the next poster! Going back today for more. Ting is a genius! Thrilled with the quality of my tattoo that Ting has done! I love my tattoo and will recommend her to anyone that wants affordable/ quality work. The place is the bees knees! Great experience whilst getting inked, and the work is out of this world! I would recommend to everybody and anybody who wishes to have a solid amazing piece done by these guys, as well as go back for another! Thank you for the awesome, awesome piece Ting! Shop is open Tuesday to Saturday: 10h00 to 16h00. For quotations and bookings please email tingtattoo@gmail.com with an idea of the tattoo you want, sizing, placement, reference images if possible and your preferred artist. Looking forward to hearing from you!